Alison King reports on the new lawmakers gathering at Harvard this week, many of whom come from diverse backgrounds. Harvard’s Kennedy School is known for attracting big names in the world of politics, but there is particular star power in Cambridge this week as the newly elected members of Congress gather for their orientation. Including Colin Allred, a Texas attorney and former NFL linebacker - now President of the incoming class of Congressmen and women - all gathered at Harvard’s Kennedy school for the traditional orientation. "I think we have a great class, regional diversity, racial, gender," Allred said. "It’s a very diverse group." Institute of Politics Director Mark Gearan says this class stands out for its accomplishments and dedication to public service - articulated at Tuesday night’s opening dinner. "They all did self introductions and it was dazzling," Gearan said. 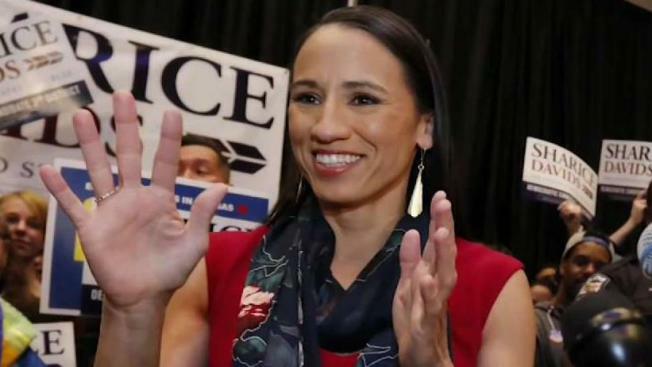 Gearan is referring to newcomers like Sharice Davids, a Native American lesbian who grew up on a reservation in Kansas, before graduating from Cornell Law school. Davis says the orientation "has been very eye-opening and gives us a chance to hear from each other through our questions, through the panels. I’m very excited." The new freshman class also includes the first two Muslim women, several veterans and a rapper with a Harvard law degree. Third district congresswoman elect Lori Trahan is one of a group of freshman, led by Ayanna Pressley, who spent part of conference day one demonstrating about healthcare and climate change. "There’s a collective urgency in this group on getting things done," Trahan said. Allred, a Democrat, says he appreciates the opportunity to socialize and make friends with Republicans. "What’s great about this is we get a chance to have a moment with people from the other side and talk about bipartisanship and how we can get things done, that’s what we got elected to do," Allred said. For the first time, Harvard did not allow reporters into any portion of the orientation - and they were extra high levels of security. An indication perhaps of the high level of interest in these incoming lawmakers.